City of Aragon, Spain. Jews were settled here as early as the eleventh century, during which the city became the seat of a Jewish high school. Sancho Ramirez the Great, King of Navarre, did not permit the Jews to grind their grain in any mill they pleased; but a certain mill belonging to the city was assigned to them and to the bread-sellers. This they were allowed to use on payment of a certain tax; and they were, in addition, compelled to pay all the usual imposts and taxes. In 1281 the Jews of Jaca and of the surrounding villages—who were engaged in industries and lived in comfortable circumstances—were obliged, like those of Gerona, to contribute toward repairing the fortifications, which had been damaged during the French invasion. In 1289 they had to pay King Jaime 6,000 sueldos toward defraying the costs of an expedition against Sicily. 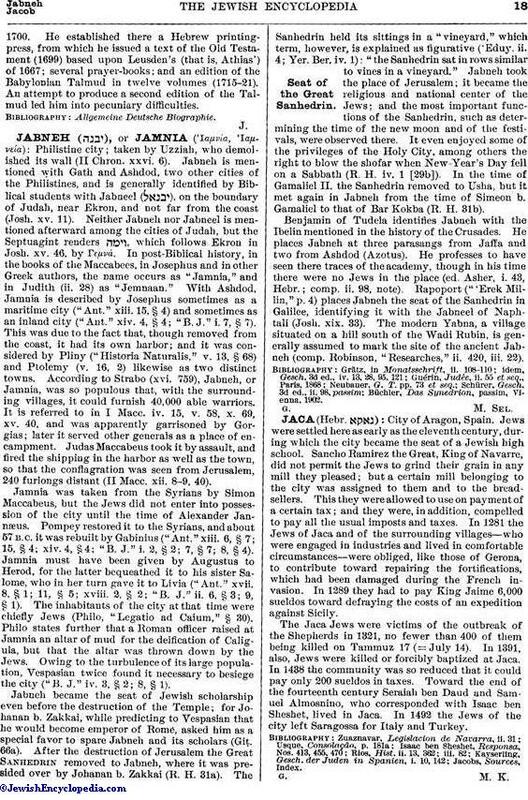 The Jaca Jews were victims of the outbreak of the Shepherds in 1321, no fewer than 400 of them being killed on Tammuz 17 (= July 14). In 1391, also, Jews were killed or forcibly baptized at Jaca. In 1438 the community was so reduced that it could pay only 200 sueldos in taxes. Toward the end of the fourteenth century Seraiah ben Daud and Samuel Almosnino, who corresponded with Isaac ben Sheshet, lived in Jaca. In 1492 the Jews of the city left Saragossa for Italy and Turkey.